After a lovely week in Hawaii, I’m now happy to be home. Maybe ’cause I’m a Kansas girl, but to me, there’s no place like home! Today’s outfit is a weekend, casual look. 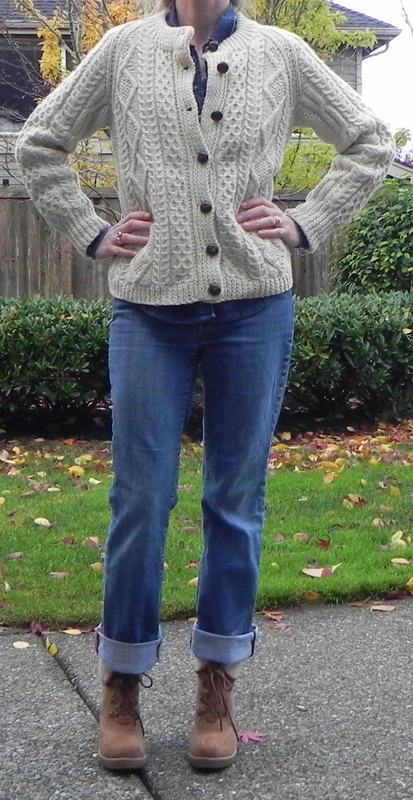 I’ve paired a denim shirt with a classic cable knit sweater and my boyfriend jeans. 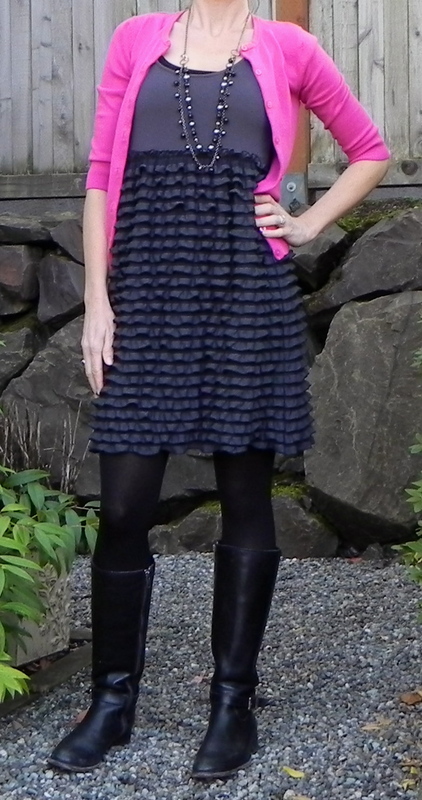 I then added my wedge boots to give the outfit an unexpected kick. On the right you can see how this over-size sweater is not quite working for me. Similar to what I showed a few weeks ago- dressing in large clothes is not flattering, no matter what size you are- it will make you look enormous. 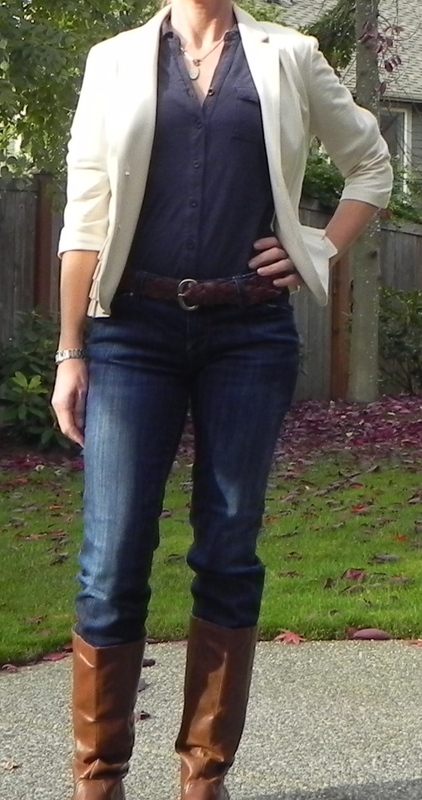 Instead, opt for something more fitted- something that works with your figure- not against it! The sweater on the left is a great example of why to always buy quality when it comes to a classic piece like this. This sweater was purchased by my grandfather in approx 1955 in Ireland. It was given to my mother- who then passed it down to me. It’s been sitting on the top shelf of my closet for years- and then I finally pulled it down, tried it on and wow! I am so excited- it’s a beautiful piece that maybe I’ll pass down to my daughter one day… you think? Love the leather covered buttons- such beautiful craftsmanship. They don't make them like this anymore! Today I’m using some pictures that a very sweet reader sent. 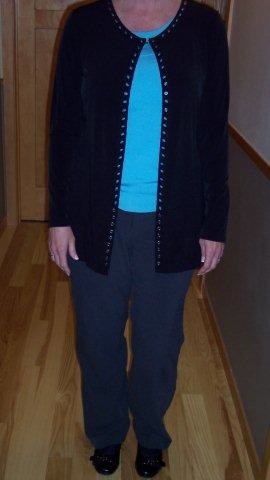 As you can see on the picture on the bottom, the black cardigan is matronly and not flattering. In the first picture, she has switched out the cardigan for a cuter style (love the way it drapes) and then added a belt to emphasize her waist. 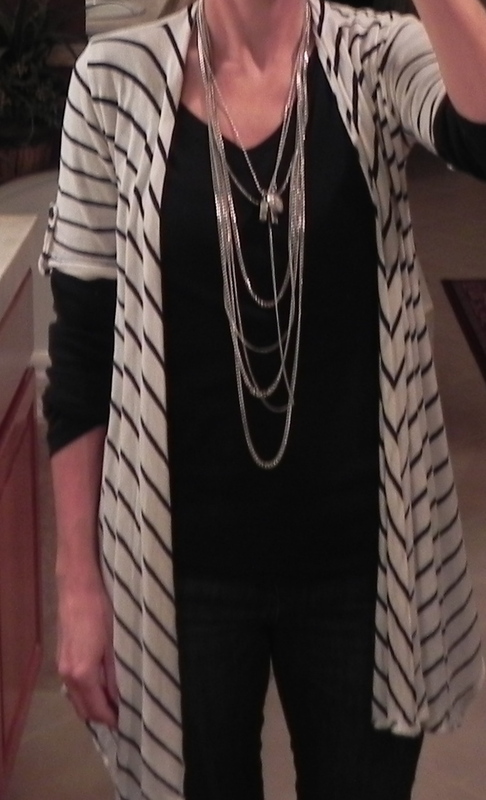 She also added a necklace- following the rule of 3! Great job Susan! 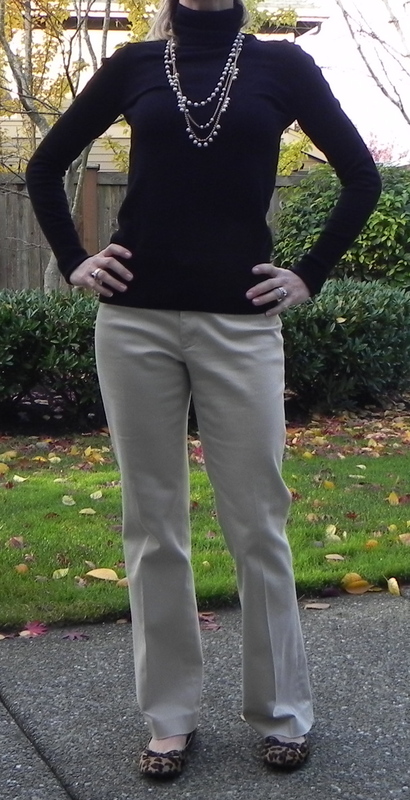 I’d love to see this top and cardigan paired with some skinny jeans instead of grey pants- and some cute ballet flats. All in all, I love the bright blue top- and the cute beaded necklace appears to reflect the blue as well. Happy Thanksgiving! I feel like I have so much to be thankful for, and rather than list them here- just know that I am extremely grateful for all my blessing and full of love for my family. Today I’m showing an outfit that I took photos of a few weeks ago. I’m showing how to take a cocktail dress and turn it in the a more casual and everyday outfit. I bought this dress at Marshalls for an all white party I was going to last summer. 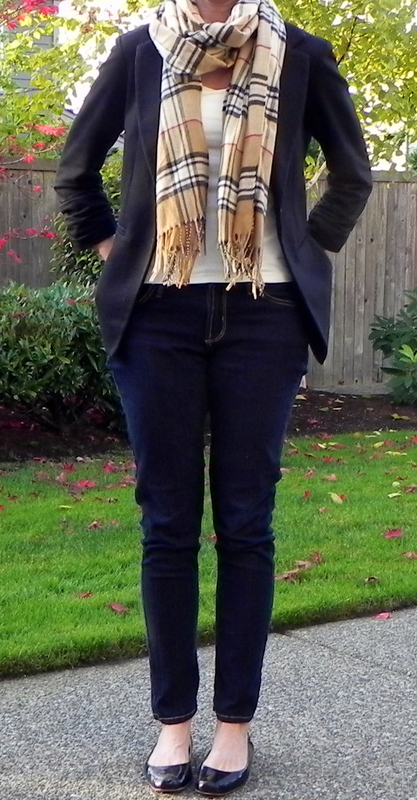 I haven’t worn it since but decided to try to tone it down a bit by pairing it with a denim jacket, scarf and boots. Now it’s a cute outfit for work or lunch with friends. Hope you have a wonderful day, enjoy your family and take a moment to be aware of all your blessings. 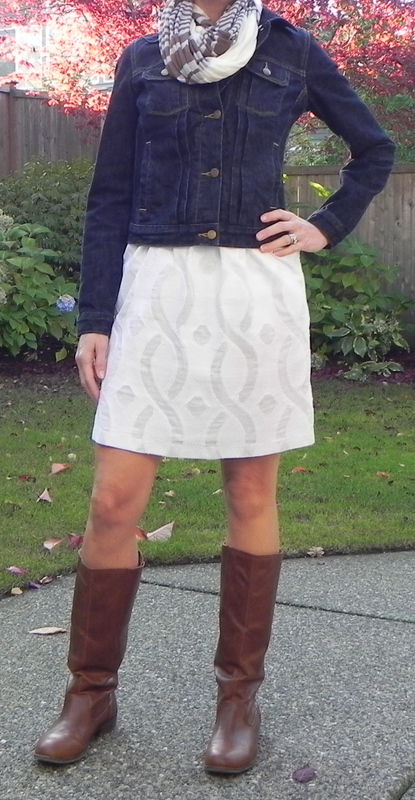 For today’s guest post I’m showing 2 cute outfits sent by a reader. They aren’t before and after shots- but just 2 outfits, one cute- one not so cute. 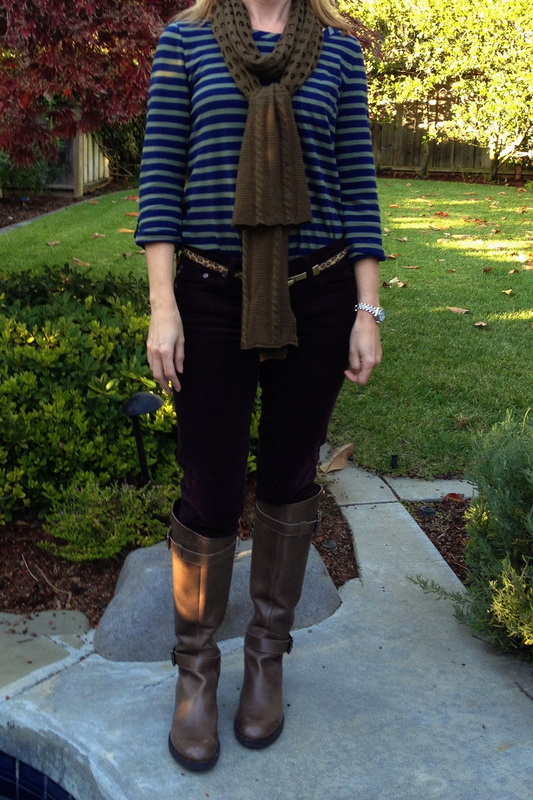 The first outfit is this cute striped shirt and skinny jeans. To compliment the look she has added this cool scarf (love the holes), a leopard belt and boots! Great mix of patterns! The only thing I would change is I would have looped the scarf one more time around my neck- just so the tail doesn’t hang down so low. 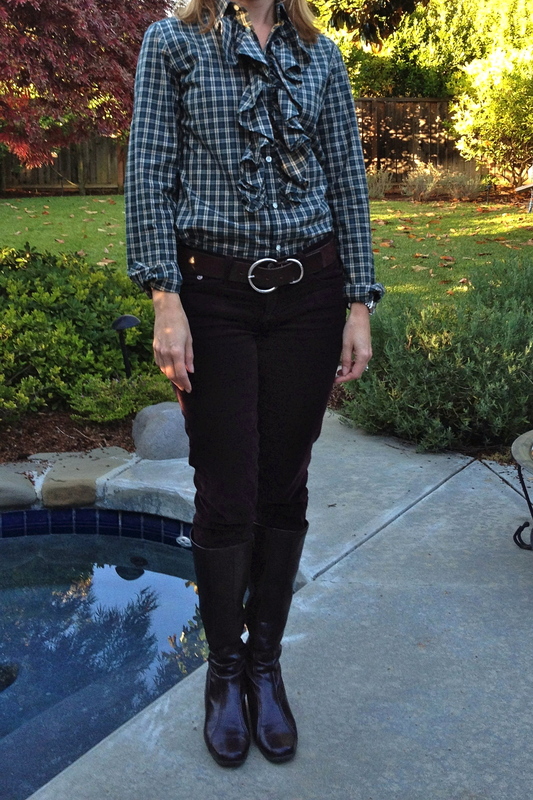 Love the scarf, the belt and the boots! Very cute look! The outfit below didn’t work out for her- in fact, because if the ruffled shirt her husband jokingly said she looked like George Washington! I don’t think he meant it as a compliment. I will say though- I’ve been seeing these shirts all over the place- but that still doesn’t make them cute. This is a good example of how just because something is popular doesn’t mean it’s right. 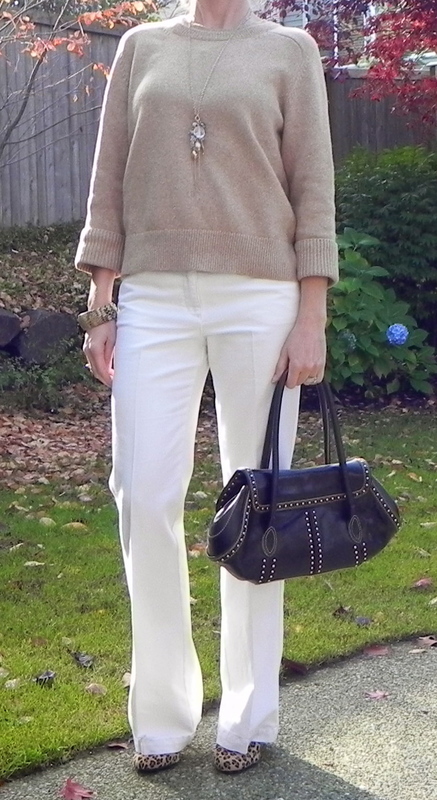 I do like her colored cords- not sure if they are brown or purple- but they look great! Thanks so much for sending these pics! Happy Thanksgiving tomorrow! This ruffle shirt just isn't doing it for me.